Downbelow Operations Manager & PADI Instructor Strike couldn’t help but to have a dive with Downbelow Managing Director & resident Platinum PADI Course Director Richard Swann to meet Ruby the Froggy. 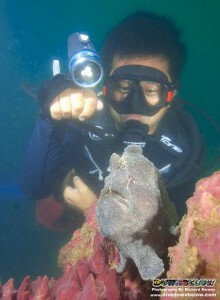 He made full use of the Sola 500 dive light which performed perfectly in the low visibility conditions. By the way, you can read our review of the Sola 500 Dive Light on our online Dive Shop. Richard & Strike first dived together around 10 or more years ago & both still love a dive together once a while. Ruby the Froggy is a shallow water Frogfish or Anglerfish from the family of Antennariidae and can be found within the Tunku Abdul Rahman Park. You can read more about them in our Frogfish Marine Biology page.